New seasons are promising for the Sun Valley Ski Education Foundation (SVSEF) freestyle and snowboard programs. Combined, the two programs have about 100 participants. SVSEF Gold Team freestyler Tai Barrymore won the first World Cup skier halfpipe of the season Dec. 9 at the U.S. Grand Prix in Copper Mountain, Colo.
On Dec. 20, SVSEF Snowboard team member Chase Josey rode to seventh place in men's snowboard slopestyle at the USSA Revolution Tour, also at Copper Mountain. According to 13th-year freestyle program director Andy Ware, Barrymore and U.S. Freestyle ski team member Shane Cordeau of Ketchum lead this year's SVSEF freestyle team comprised of 76 kids. "We have another strong team assembled this season and the enthusiasm is very high," Ware said. The SVSEF freestyle team trains with athletes seven years and older teaching them to ski in the moguls, halfpipe and terrain parks. Ware added, "Any open run on Baldy and Dollar, that's where you'll find us skiing. We teach basic ski technique and show athletes how to apply that technique to bumps, jumps and all types of snow conditions. "Our athletes are benefiting from Sun Valley's efforts to make snow and build parks early. Many ski areas are struggling to open let alone have their parks built yet." The freestyle team hosts an Intermountain Division event, "Sun Valley Freestyle Spectacular," from Jan. 26-29 with halfpipe, slopestyle, moguls and dual moguls competitions. Also scheduled is an Intermountain Gatorade Championship freestyle event Feb. 24-25 at Sun Valley. 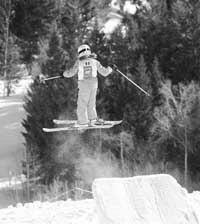 Other Intermountain freestyle events are Jan. 12-15 at Snowbowl, Mt. ; Jan. 19-22 at Park City, Utah; Feb. 2-5 at Bridger Bowl, Mt. ; and Feb. 9-12 at Deer Valley, Utah; with the divisional finals March 1-4 at Park City. Andy Gilbert, SVSEF snowboard program director for the 18th year, is excited about the diverse group of riders on his Comp Team including last year's national champions Ali Appleton and Ryan Roemer. "Ali and Ryan will step it up into the Open Class this year in all events," said Gilbert. "Chase (Josey) started the season pulling down two really good results at Copper—15th in the Rev Tour pipe and 7th slopestyle against a good group of U.S. team racers. "We have a tight knit group of kids on Comp Team. It makes training fun. The only bittersweet thing is we have four graduating seniors out of eight on the team. We'll try to make their final year special." The Prep Team is one of the bigger success stories that the local snowboard program has experienced, Gilbert said. Head coach is Jacob Tyler who, according to Gilbert, could coach anywhere in the country but prefers to work with the younger kids at Sun Valley. Gilbert said, "These 12 kids on the Prep Team get some of the best coaching in the country. We've been building from the bottom up. The Prep Team kids will ride all day long. They're progressing faster with the coaching and the changes at Dollar Mountain. We've decided to open up regional competitions to them a little more." The head coach added, "We may have a smaller team, but the quality is there." Sun Valley riders will compete in four United States of America Snowboard Association (USASA) events prior to national competition at Copper Mountain in early April. Dollar Mountain is the site for the Sun Valley USASA event Thursday and Friday, Feb. 2-3 (boardercross), plus Saturday, Feb. 4 (slopestyle) and Sunday, Feb. 5 (halfpipe). "It's the first time we've had everything at our home event on Dollar," said Gilbert. Other USASA events are Jan. 28-29 at Jackson Hole, Wyo. ; Feb. 25-26 at Brighton, Utah; and March 1-4 at Park City. Revolution Tour events are Jan. 8-13 at Tahoe (Ca. ), Jan. 29-Feb. 3 in Michigan and March 12-16 in Vermont. Program director—Andy Ware (13th year). Coaches—Comp Team: Joey Cordeau (head coach, moguls) and Ben Verge (head coach, park & pipe). Assistant Comp coaches: Ross Falcone, Clint Lightner, Chris Rybak and Josh Zuck. Development Team: Justine Kaiser (head coach). Assistants Devo coaches: Mike Sheehan, Todd Bracher, Kurtis Fieguth, Jamie Collins, Jennifer Diehl and Jake Kaiser. Freestyle Comp Team (17)—Marbella Barrymore, Perry Boyle, Colter Brehmer, Wilson Dunn, Hayes Gilman, Blake Harmon, Hannah Haupt, Alysha Herich, Alvaro Jiraldo, River Kelly, Zac Maricich-Siele, Trevor Norris, Jack Rizzo, Eli Roberts, Renee Shapiro, Claire Siderman and Wyatt Wilson (tuition $2,500). Freestyle Prep Team A (19)—RJ Bracken, Brody Buchwalter, Wilder Curtis, Hunter Diehl, Timo Gould, Frederick Grathwohl, Giselle Harmon, Trevor Hattabaugh, Alex LaFleur, Nathan Moses, Trey Potter, Luke Rizzo, Jamie Rollerson, Cooper Roquet, Morgan Shaver, Ian Thomas, Gil Viesturs, Ella Wathne and Ian Wilkinson (tuition $1,875). Freestyle Prep Team B (12)—Ben Anderson, Devon Brown, Henry Cherp, Evathea Drougas, Fallon Flaherty, Eliza Marks, Parker Nance, Aloe Orison, Mikel Sanchez-duPont, Kobe Tamura, Jack Wojcik and Kohler Wood (tuition $1,375). Freestyle Devo Team (26)—Erik Babcock, Blake Beckwith, Charlie Berridge, Frances Cherp, Griffin Connelly, Axel Diehl, Angus Gilbert, Johnny Hagenbuch, Axel Hattrup, Brian Heekin, Jack Horowitz, Kate Horowitz, Joe Markthaler, Katie Markthaler, Nicholas Maumus, Anders Nelson, Jack Oliverio, Christopher Pedersen, Will Penrose, Tanner Post, Will Price, Addison Rafford, Toby Rafford, Addie Shandro, Rainey Wilson and Logan Wojcik (tuition $975). Program director, Head Comp Team coach—Andy Gilbert (18th year). Head Prep Team coach—Jacob Tyler. Coaches, staff—Andy Gilbert and Josh Keefer (Comp Team); Jacob Tyler, Heather Black, Edward Sawitz and Jon French (Prep Team). Competition team (8)—Ali Appleton, Josie Bunce, Chase Josey, Rex Kelly, Quinn Magner, Ryan Roemer, Connor Smith and Dash Stethem (tuition $2,900). Prep Team (12)—Payton Bacca, Amelia Cookston, Colton Donovan, Austin Eggers, Phebe Ericksen, Colin Finnerty, Clara Jenner, Emerson McCune, Clyde Montgomery, Cora Schneider, Lieder Schwartz and Elk Spencer (tuition $2,200).